On Saturday, Shah Rukh Khan-Kajol's "Dilwale" has collected Rs 19 crore at Indian box office, taking 2 day domestic collection to Rs 40 crore nett. Shah Rukh Khan's "Dilwale" continued to do well at the Indian box office on its second day. Despite clashing with Ranveer Singh's "Bajirao Mastani", it crossed mark of Rs 40 crore nett. "Dilwale" is one of the most hyped films of 2015, talked about so much for two reasons. First, it marked the comeback of actress Kajol. Second, it brought back the successful pairing of Kajol and Shah Rukh Khan, whose sparkling chemistry has worked wonders in some Hindi movies. But its prospects looked dim at the box office as it clashed with Sanjay Leela Bhansali's much-talked-about "Bajirao Mastani". Though it had superb advance booking, trade experts were a bit sceptical about a big opening for it as it had to screens and shows with "Bajirao Mastani". Another big threat to the movie was some fans' outburst over Shah Rukh Khan's views on intolerance in India. The Rohit Shetty-directed romance drama released in over 3,000 screens across the domestic market and debuted to fantastic response everywhere. Though its screening was cancelled in some centres due to protests, "Dilwale" collected Rs 21 crore nett at the Indian box office on the first day. The film became the third-biggest opener of 2015 after "Prem Ratan Dhan Payo" and "Bajrangi Bhaijaan". The Shah Rukh Khan and Kajol-starrer received mixed response from the audience, who seemed to be impressed with its commercial ingredients. The word of mouth was expected to take its business forward on Saturday, but the movie saw a slight dip. "Dilwale" has collected Rs 20.09 crore nett at the domestic box office on its second day. 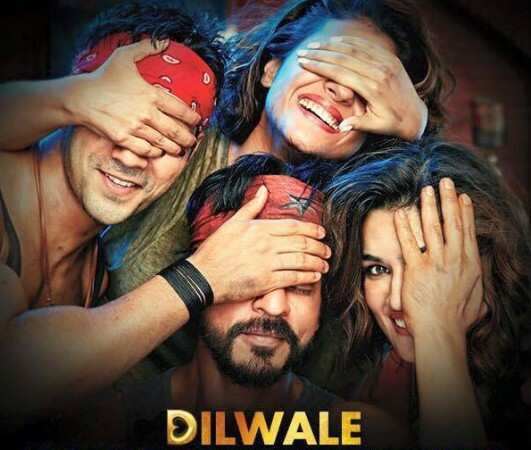 "Dilwale" has collected approximately Rs 41.09 crore nett at the Indian box office in two days. Taran Adarsh â€tweeted, "#Dilwale Sat biz remains the same as Fri. However, biz should get a BIG BOOST on Sun. Fri 21 cr, Sat 20.09 cr. Total: â‚¹ 41.09 cr. India biz. (sic)"
Trade analyst had predicted that the film would cross the mark of Rs 50 crore in two days and inch closer to the Rs 100-crore mark in the domestic market in its opening weekend. However, it has failed to live upto their expectations. Then again, "Dilwale" has stormed key international markets like the US, the UAE and the UK. The film has collected Rs 22.61 crore gross ($3.4 million) at the overseas box office on its opening day. The makers are yet to reveal its second-day numbers. Taran Adarsh tweeted, "#Dilwale opens to IMPRESSIVE numbers Overseas. Fri total: $ 3.4 million [â‚¹ 22.61 cr]. SUPER! (sic)"